Please wait the page is loading. It is, quite simply, a magnificent place. Omboué provides an excellent touring base from which to explore the surrounding countryside. A charming 19th century mission with its red facade. Stroll around Omboué and experience life in an African. 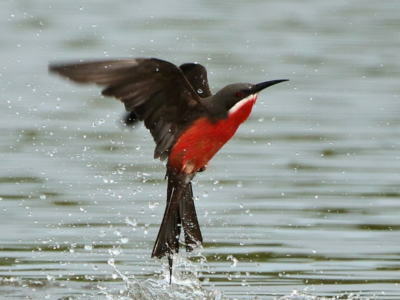 For the birdwatcher, the area is paradise. Elephants, monkeys, gorillas, hippos and bush pig. 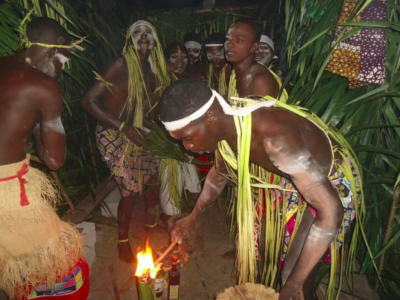 A night of traditional Gabonese music and dance. If true solitude is what you are seeking. 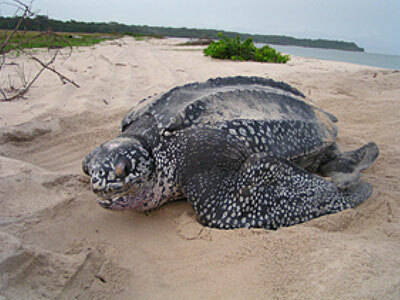 Witness the giant Leatherback Sea Turtles come ashore. 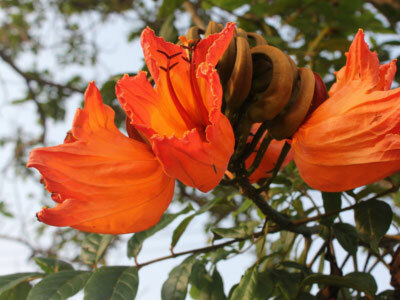 Visitors can explore the world of tropical plants. A relatively unknown, under-populated country where mass tourism has not yet emerged. It is, quite simply, a magnificent and peaceful place. The following excursions are offered daily (except where otherwise stated), either independently or limited to a maximum of six people per mode of transport. The Original programmes can be modified if required. Prices depend on the number of people in the group. Tours involving a motorboat have the added security of a back-up motor (2 x 40 horsepower engines). Please contact Hotel Olako directly for further information. 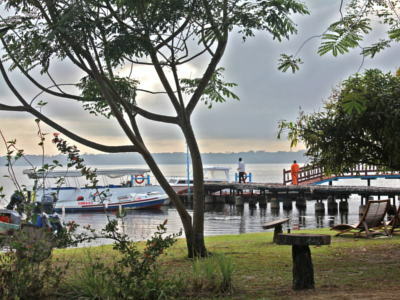 Visitors can fly to Port-Gentil (Gabon's economic capital) from Libreville before transferring to a boat operated by the hotel. The air route between Libreville and Port-Gentil (25 minutes approximately) is well served with approximately 60 scheduled flights weekly shared by various companies. 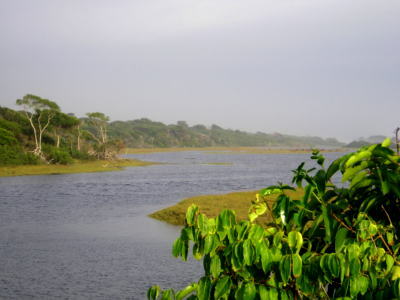 The journey between Port-Gentil and Omboué normally takes about three hours and offers visitors the experience of four ecosystems: sea, river, rainforest and laguna. *Half price for children under 10. *10 kgs/passenger allowed. 250 XAF/kg extra (child/adult). 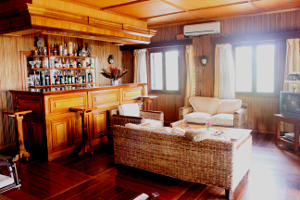 Guests who wish to tour the surrounding area independently can arrange to rent one of the hotel boats or 4 X 4 by prior arrangement of Hotel Olako's Marketing Department. *Other destinations: to set with the manager. 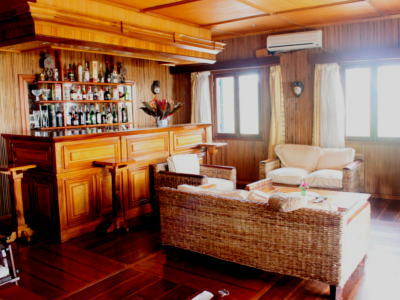 Hotel Olako has ten standard rooms and one suite ideal for families or clients who desire more space. Each bedroom is individually decorated in a traditional style and bears the name of the African wood from which it is fashioned. All rooms are equipped with a double or single bed, hot and cold running water and air conditioning. Check out is 12.00 noon although this time can be extended by prior arrangement with the Front Desk. Payment is by cash and can be made either in F CFA or Euros. a library and reading room for the reading enjoyment of our guests. Discover a wide range of publications on Gabon and Africa on topics ranging from history to bio-diversity as well as some old pre-Shell seismic maps (circa 1950) of the region which decorate the wall. An Internet lounge equipped with two computers connected to the Internet. You may also use the hotel’s complimentary Wi-Fi connection in the computer room and on the terrace. a terrace looking onto the lagoon. a restaurant on stilts on the lagoon. For families with young children, supplement beds are available. Payment for services rendered by the hotel, restaurant or bar is by cash and can be made either in F CFA's or Euros. Hotel Olako's unique restaurant offers a whole new dining experience. Built on water and accessible by a walkway, guests can enjoy good food and a marvelous view of the surrounding lagoon. Enjoy fish, free-range chickens, fresh eggs, local fruit, organic vegetables and pressed juices from Nzaloungou Botanical Garden. Our 'Taste of Gabon' section of the menu features local and national dishes from Crabe farci a la fondue de tomate (blended local crab garnished with fresh tomato sauce and served on the shell) to Poulet au Nyembwe (chicken cooked in palm nut sauce). Hotel Olako has put together an array of sandwiches and cold beverages for the convenience of guests planning excursions into the surrounding area. Download our menu and price list. Enjoy a drink or a well-earned 'legs up' in the comfort of our air-conditioned bar while catching up on the latest news (CNN and EuroNews) from the outside world. You may use the hotel’s complimentary Wi-Fi connection in the garden and on the terrace. Hotel Olako has a safe available for guests who prefer not to travel about with their valuables. Omboué is linked to the rest of the world by land line and mobile network (Moov, Libertis and Airtel). Clients can use their mobile phones in Omboué but must purchase a SIM card for Gabon before travelling to the interior. Phone cards in various denominations are on sale at the Front Desk. Guests wishing to place outgoing calls can do so on the Hotel's mobile phone. Rates are based upon country called and number of minutes. Guests can arrange to have their clothes washed and pressed for the following day. The hotel provides guests with mountain bikes with which you can visits Omboué and its outskirts. Jogging around Omboué is also a possibility. Guests wishing to exchange money must do so in advance. Currently there are no banking facilities in Omboué. There is a doctor available for general consultations. Any specific matters are referred to Libreville's private medical clinics. Visitors are strongly advised to take out adequate insurance before embarking on their journey. Coverage should take into account medical expenses including emergency evacuation, personal liability and trip cancellation. Omboué's only pharmacy (chemist) is open during the morning and late afternoon (closed between noon and 3.00 p.m. and on Sundays) for guests requiring basic medication. Travellers with specific requirements should 'stock up' before departing for the interior. The Grande Pharmacie des Forestiers at Libreville's major shopping centre M'Bolo is excellent with the added advantage of being able to pay by Visa for purchases over 10,000 F CFA. Basic necessities such as shampoo, toothpaste, soap and so forth can be purchased in Omboué's small village centre. Local arts-and-crafts can also be found, such as mats, baskets, calabashes and masks. Guests wishing to send mail by post should do so from Libreville, Port-Gentil or any other major centre. Visiting hours are regulated and limited. All visits must be booked within a minimum of 24 hours. We will then be pleased to welcome you and make you visit the sanctuary. An educational speech on gorilla conservation will be offered and a guide will assist you during the visit. The Fernan-Vaz Gorilla Project (FVGP) was initiated in 2001 by Operation Loango (now Africa's Eden). The overall objective of Africa's Eden is to develop responsible tourism that can finance conservation and local development in Gabon. 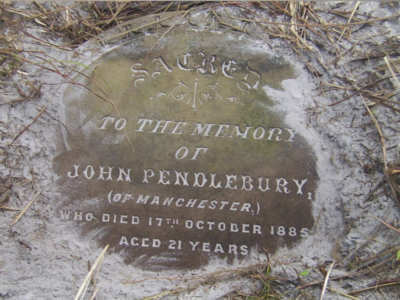 The sanctuary: in the beginning, the FVGP aimed to improve gorilla quality of life, who, victims of poaching, later lived in a research center. Not being able to be reintroduced in the wild, the gorillas were transferred to a semi-natural environment surrounded by an electrified fence in the Fernan-Vaz region. Mabeke, a silverback born in 1979, is an important ambassador for educating visitors on the bush meat crisis. Western lowland gorillas and all the world’s Great Apes are endangered because of habitat loss, commercial hunting, emerging diseases, political instability in some African countries and illegal trade in pets. 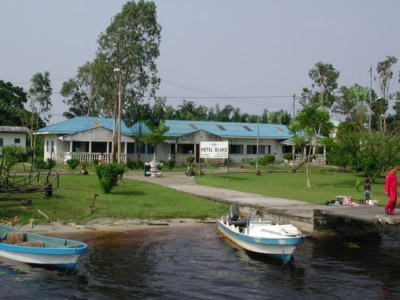 The Rehabilitation Center: alongside the sanctuary which is accessible to visitors, FVGP initiated the development of a Rehabilitation Centre (CR) since late 2006. The objective of the CR is to rehabilitate baby gorillas victim of illegal trade and that have been legally confiscated by the Gabonese authorities. We hope that these baby gorillas in rehabilitation phase will eventually be reintroduced into the wild. To prevent the transmission of disease, stress (gorillas are discreet and reserved animals) and the risk of them getting used to humans, visits are not allowed. Never the less, we will be happy to inform you about the progress and the latest news of the rehabilitation program of these baby gorillas who spend their days free in the forest. 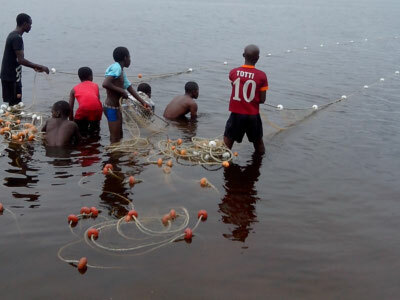 Formerly under the management of Operation Loango, the FVGP knows today an exclusive management and hopes to soon become a Gabonese Association under the emblem of the Société de Conservation et Développement (SCD). The ultimate goal of PGFV is to help reduce or eliminate the trade in bush meat and pets to which the Great Apes fall victim. Given this objective, the FVGP is dedicated to offer an educational experience on gorilla conservation. 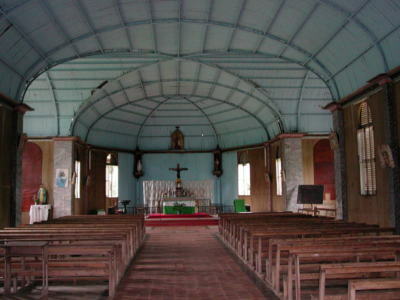 The Mission was founded by Father Bichet in 1887. The church was designed and built by Gustave Eiffel in Paris and transported in pieces to St. Anne where it was built in 1889. It is a mixture of color and visual contrasts. The dark rust color and simple silhouette of the church nestled in the green palm trees make it worthwhile to visit, be it only for the opportunity of taking a photo. Located off the beaten track on the edge of a lagoon, visitors who approach by the river have their first glimpse of the Mission by the church spire rising above the canopy. One is immediately struck by the surrounding atmosphere of peace and tranquility due in part to the isolation of the site. For lovers of ecotourism, Evéngué, or Gorilla Island, is a sanctuary accessible to visitors. Its primary mission is to improve the quality of life of gorillas threatened by human activity and to allow, if possible, their reintegration in the wild. We invite you to share this enriching experience and discover the secrets of these primates. Details of the tour: Daily departures. We will cross the lagoon of Fernan Vaz by motorboat, a journey of about 30 minutes, before reaching the Mission’s landing stage. We begin our tour at the Mission, led by the priest, then visit the church and finish with a stroll through the forest abounding with wild orchids. 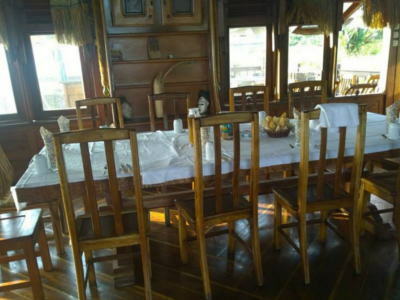 We will then have lunch with a fabulous view overlooking the lagoon before continuing, if applicable, to Gorillas Island. 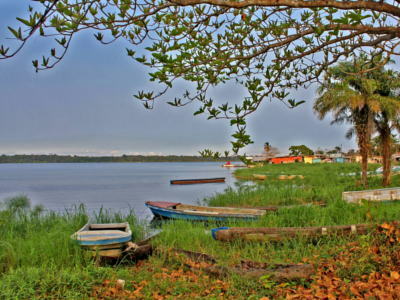 Loango covers an area of ​​1550 square kilometers of lagoons, forests, savannas and swamps and over 100 kilometers of uninhabited coastline. Part of the rainforest of the Congo Basin - the second largest rainforest in the world, its uniqueness is that it is perhaps the only place on Earth where you can see antelope, elephants, hippos, buffalo, monkeys, chimpanzees, gorillas and leopards venturing onto the beach. The region also boasts of having the largest concentration in Africa of whales and dolphins after South Africa. Details of the tour: This tour is for people who get up early! The hour and a half trip by 4X4 on a dirt road to the park combines savannah and rain forest and provides visitors with a wonderful opportunity to experience, see and feel the African bush. 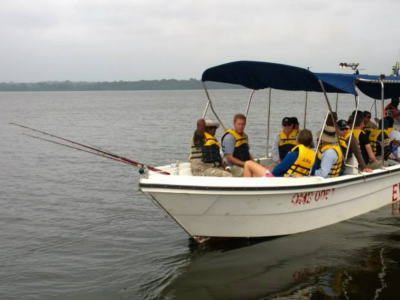 We will make the crossing to Loango by motorboat before transferring into one of the park’s 4X4 for two and a half hours of safari in the savannah and rainforest. Les heures de visites sont réglementées et limitées. Toute visite doit être réservée dans un délai minimum de 24 heures. Il nous fera par la suite plaisir de vous accueillir et de vous faire visiter le sanctuaire. Un discours éducatif sur la conservation des gorilles vous sera offert et un guide vous assistera durant la visite. Le Projet des Gorilles du Fernan-Vaz (PGFV) fut initié en 2001 sous les ailes d'Opération Loango (aujourd'hui devenu Africa's Eden). 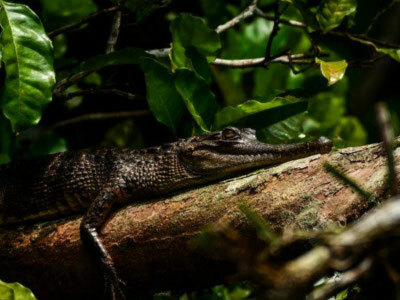 L'objectif global d'Africa's Eden est de développer un tourisme responsable qui puisse financer la conservation et le développement local au Gabon. Le sanctuaire : dans ses débuts, le PGFV visait à améliorer la qualité de vie de gorilles jadis victimes du braconnage, ayant par la suite vécu dans un centre de recherche. Ne pouvant être réintroduit en milieu naturel, ces gorilles furent transférés dans un milieu semi-naturel entouré d'une clôture électrifiée dans la région de Fernan-Vaz. Mabeke, un dos argenté né en 1979, représente un ambassadeur important pour la sensibilisation des visiteurs sur le phénomène de la viande de brousse. Les gorilles des plaines de l'Ouest, ainsi que tous les grands primates du monde, sont en voie de disparition à cause de la perte de leur habitat, de la chasse commerciale, des maladies émergentes, de l'instabilité politique dans certains pays africains et du commerce illégal des animaux de compagnie. Le Centre de Réhabilitation : mis-à-part le sanctuaire, accessible aux visiteurs, le PGFV a initié l'élaboration d'un Centre de Réhabilitation (CR) depuis la fin 2006. L'objectif du CR est de réhabiliter des gorillons victimes du commerce illégal des animaux de compagnie et ayant été confisqués légalement par les autorités gabonaises. Nous espérons que ces gorillons en phase de réhabilitation pourront un jour être réintroduits dans leur milieu naturel. Pour éviter la transmission de maladies, le stress (les gorilles sont des animaux discrets et réservés) et le risque de les voir s'habituer aux humains, les visites sont interdites. Par contre, il nous fera plaisir de vous informer sur le déroulement et les dernières nouvelles du programme de réhabilitation de ces gorillons qui passent leurs journées libres en forêt. Jadis sous la gestion d'Opération Loango, le PGFV connait aujourd'hui une gestion exclusive et espère bientôt devenir une association gabonaise sous l'emblème de la Société de Conservation et Développement (SCD). L'objectif ultime du PGFV est de contribuer à atténuer, voire éliminer, les commerces de la viande de brousse et des animaux de compagnie dont les grands-singes sont victimes. Au vu de cet objectif, le PGFV se dévoue à vous offrir une expérience éducative sur la conservation des gorilles. La Mission fut fondée par le Père Bichet en 1887. L’église a été conçue et fabriquée par Gustave Eiffel à Paris et acheminée en pièces détachées jusqu’à Sainte Anne où elle fut construite en 1889. Elle constitue un mélange de couleur et de contrastes visuels. La couleur rouille foncée et la simple silhouette de l'église blottie dans la verdure des palmiers font qu'une visite ici, rien que pour l'occasion d'une photo, en vaut la peine. Située hors des sentiers battus sur le bord d'une lagune, les visiteurs qui s'en approchent par la voie fluviale ont leur premier aperçu de la Mission par la flèche de l’église qui s'élève au-dessus de la canopée. L'on est immédiatement frappé par l'atmosphère environnante de paix et de tranquillité attribuables en partie à l'isolement du site. Pour les amateurs d’écotourisme, Evéngué, l’Ile aux gorilles, est un sanctuaire accessible aux visiteurs. Sa mission première est d’améliorer la qualité de vie de cette espèce menacée par l’activité humaine et de permettre, si possible, leur réinsertion en nature. Nous vous invitons à partager cette expérience enrichissante et à découvrir les secrets de ces primates. Détails de l'excursion: Départs quotidiens. Nous traverserons la lagune de Fernan Vaz par bateau à moteur, un voyage d'environ 30 minutes avant d'accéder aux terres de la Mission à partir du débarcadère. 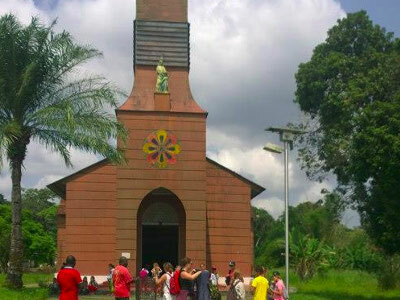 Nous commencerons notre tour à la Mission, menée par le Prêtre, puis visite de l'Église pour finir par une promenade à travers la forêt où abondent les orchidées sauvages. Nous ferons honneur à un déjeuner à terre avec une vue fabuleuse surplombant la lagune avant de continuer, le cas échéant, sur l'Ile aux gorilles. Loango couvre une surface de 1 550 kilomètres carrés de lagunes, forêts, savanes et marécages, ainsi que plus de 100 kilomètres de littoral inhabité. Partie de la forêt tropicale humide du bassin du Congo - deuxième plus grande forêt tropicale humide du monde, son caractère unique réside en ce que c'est peut-être le seul endroit sur terre où l'on peut observer antilopes, éléphants, hippopotames, buffles, singes, chimpanzés, gorilles et léopards s'aventurant sur la plage. La région se vante également de posséder la plus grande concentration, en Afrique, de baleines et de dauphins après l'Afrique du Sud. Détails de l'excursion: Cette excursion est destinée aux personnes qui se lèvent tôt ! Notre voyage d'une heure et demie en 4X4 vers le parc combine savane et forêt tropicale humide sur une route en terre et fournit aux visiteurs une merveilleuse occasion d'éprouver, de voir et de sentir la brousse africaine. 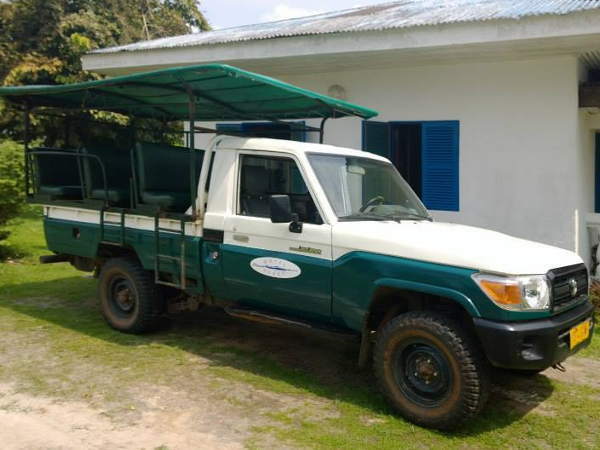 Nous effectuerons la traversée vers Loango par bateau à moteur avant le transfert dans l'un des 4X4 du parc pour deux heures et demie d'un safari dans la savane et la forêt tropicale humide.